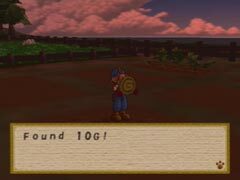 Mining is run more differently then any other Harvest Moon game. Instead of going to a cave to mine you can simply mine on your own farm. If you have open spaces from where the crops go, you can till away with your hoe until you mine something up. You can hit the same spot over and over and still find some minerals. This is a good source of income, although it is hard on the stamina of the Hero.